To teach the Zenon Wudang T'ai Chi Relaxation Programme. To run regular courses and to offer advice on health and fitness to members of the community through radio, TV and the multi-media. To hold conferences where the Institute will invite clubs and groups to share features of the healing arts and activities within the community. To represent all activities where the focus is primarily based on physical activities which benefit both the body and mind. 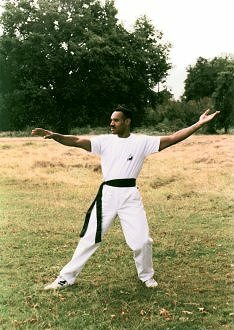 To represent martial art groups, clubs etc, and other physical activities like Karate, Tae Kwon Do, T'ai Chi, Kung-Fu, Indian Head Massage, Yoga, Shiatsu, Rei Ki, Colour Therapy, etc., practiced by the groups that cater for the African Caribbean and Asian community. To provide a list of all registered instructors and clubs on the Internet, and to provide written information, photographs and visual action clips of their individual system, so that the potential learner may evaluate the benefits offered before joining the class. To link up with providers of the Healing Arts internationally, and to facilitate affordable holidays and accommodation and courses worldwide through the Net. The Caribbean Institute welcomes applicants to join its membership worldwide. Vacancies open to all venues where the healing arts and martial arts are practiced and from all qualified instructors. You may be required to give a demonstration of your system to our panel of judges. The Trinidad open Martial Art Tournament. St Lucian Tai Chi Pushing Hands Championships. British Open Pushing Hands tournament. The American National Martial Art Tournament. The Canadian Tai Chi and Kung Fu Tournament. South East Asia Martial Arts Championships.